League of Melbotis: Policy: JimD or Randy? Would want as my backup when we're going to have to shoot our way out? Neither. Maybe Emily. *Yes, summer of 1997, I watched a lot of Fresh Prince and drank cheap beer. I was also only partially employed. Would Randy or JimD be more likely to end up inadvertantly floating 5000 feet above the earth in a homemade balloon? I'm guessing Randy. I can't begin to believe it wouldn't be Randy. Back when I was fresh out of college, Yahoo would often post jobs for the position of "Web Surfer". I applied once a week for a year. And BTW, I would destroy JimD in a lightsaber duel. 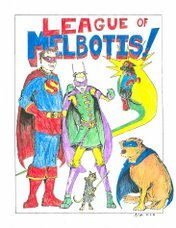 Did yo know someone bought and pointed melbotis.com to this blog?